This is a fashion pak sleeveless scoop neck dress. 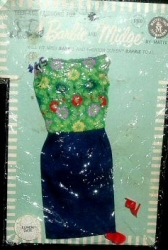 The dress with the green skirt has a bodice made of the same fabric as Poodle Parade #1643 (1965) . The dress with the navy skirt has a bodice made of the same fabric as Knit Hit #1621 (1965) .